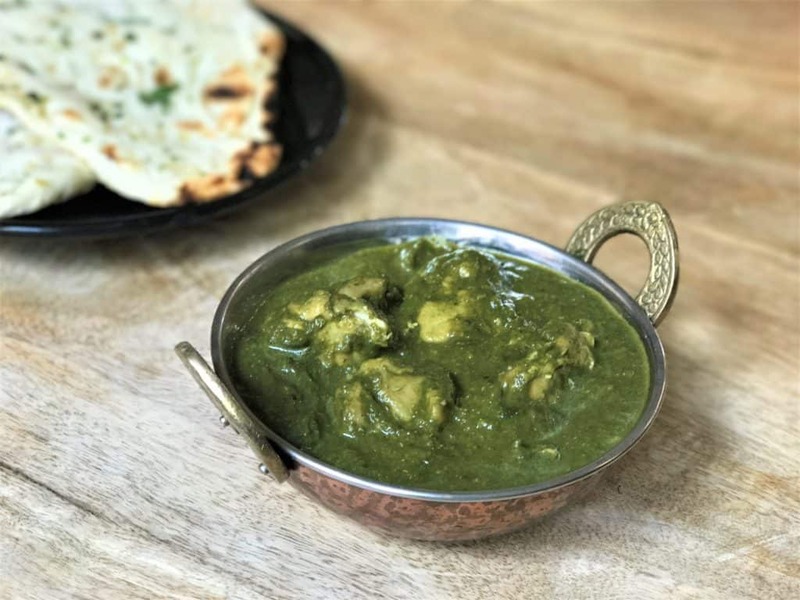 Instant Pot Chicken Saag (Chicken & Spinach Curry) is a delicious dish from north India. A step-by-step recipe to prepare this in the Instant Pot or Pressure Cooker. Chicken is simmered in a creamy spinach sauce. Sounds exotic? Don’t worry, it is super easy to make. This curry is full of flavor and loaded with nutrients. 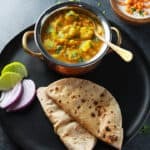 You will always find some version of this curry in any Indian restaurant and is a popular one to order. “Saag” is basically a Punjabi term used for leafy green preparations. 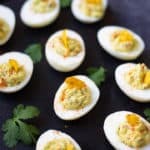 These could be make with spinach, mustard greens, chard, etc. In this Chicken Saag, I used spinach, but feel free to use other greens that you like. This curry is a healthy way to incorporate leafy greens in a kids meal. My daughter loves everything saag, so I make multiple versions of it – Palak Paneer, Saag Paneer and Saag Aloo with mustard greens and Vegan Palak Tofu. 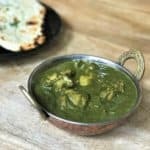 How to make Chicken Saag in Pressure Cooker? This is a very quick, one-pot recipe. 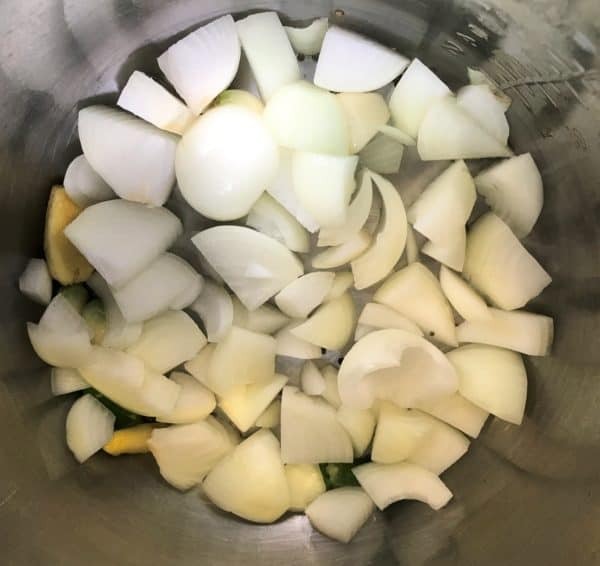 Start the instant pot and add in the oil, cumin, ginger and garlic. Then add in the chopped onions and sauté for a few minutes. The ingredients can be cut into large pieces as we are going to blend them later. Add the spices and stir them with the onions. Add water and deglaze the pot (important for newer versions of instant pot). Then add in the spinach leaves and place the chicken on top of the spinach leaves. Cook on manual or high pressure for 8 minutes. When the instant pot beeps, quick release the pressure manually. Remove the chicken pieces on the top and keep aside. Then use the immersion blender to grind the ingredients in the pot to a smooth paste. 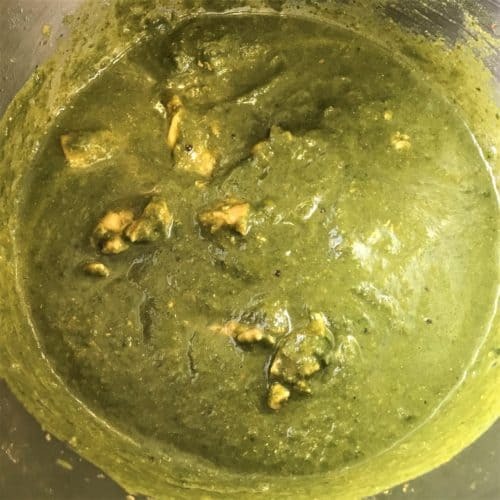 You can also use a normal blender to grind and then transfer the saag back to the instant pot. 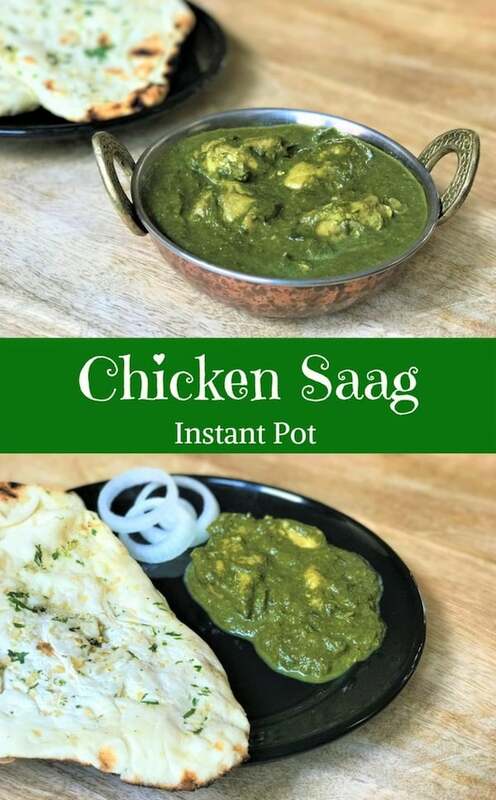 If needed, cut the chicken pieces to the desired size and transfer them back to the saag in the pot. Simmer for a few minutes so the chicken is mixed well with the greens. Use a glass lid when simmering as there could be some splutters when spinach boils. 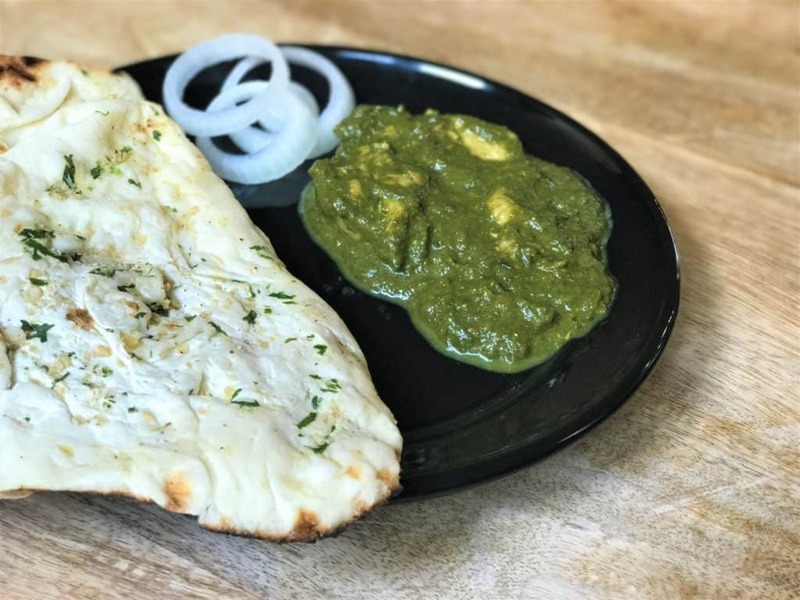 Chicken Saag is ready to be enjoyed with naan or rice. Enjoy the goodness of spinach and chicken in this hearty and healthy recipe. 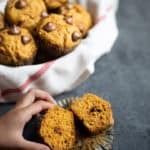 Give this recipe a try and I am sure you are going to love it as much as we do! This one-pot Chicken curry with spinach is one of the delicious north Indian dish. Chicken simmered in a creamy spinach sauce, makes it a nutritious dish for all. Add the cut onions, ginger and garlic. Saute for couple of minutes. Add the spices and stir well. Add water and deglaze the pot. Add the spinach and carefully place the chicken pieces on top of the spinach. Press CANCEL and close the instant pot lid with vent in sealing position. Press MANUAL or Pressure Cook mode for 8 minutes. When the instant pot beeps, do a quick pressure release. PRESS Cancel. Open the lid, remove the chicken pieces and set aside. Blend the spinach and other ingredients to a creamy texture preferably using an immersion blender. 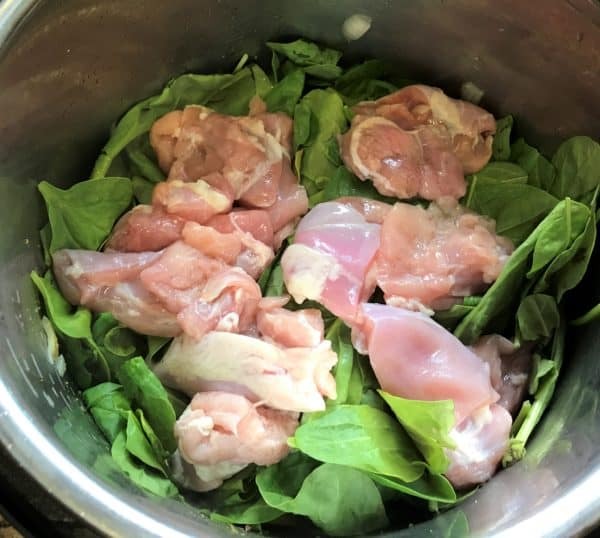 If needed, cut the chicken into smaller pieces and then add it back to the spinach curry. Press SAUTE and give the curry a quick boil. This could splutter out, so cover with a lid. 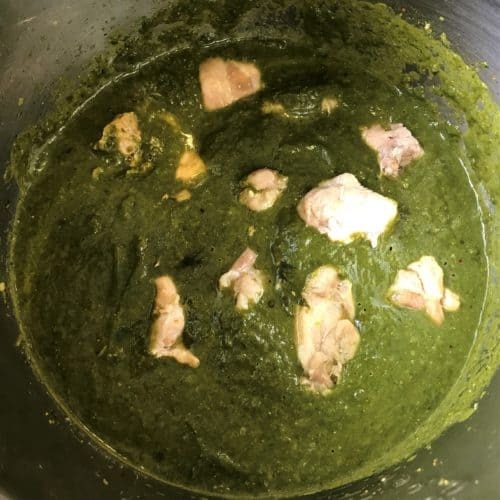 Chicken Saag is ready. 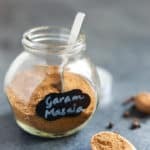 Enjoy with naan, roti or rice. If you don't have an immersion blender, you could transfer the ingredients to a regular blender, blend to a smooth paste and then transfer them back in the instant pot insert. I used spinach in this recipe. However I have made this using spinach and chard or spinach and mustard greens, and they come out great. If the chicken is not well cooked, then boil for a bit longer in step 7. If using chicken breast, cut into 2-3 pieces and pressure cook for 6 minutes. We’re plant-based smas i wonder if this would work with soycurls. If i renydrated the discussions before putting them in the IP, do you think it would ok to cook on hi pressure for only two min with quick release? 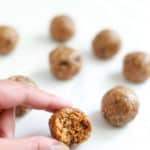 Hi Janet – Unfortunately I have never tried using soy curls in this recipe, so it is hard for me to say how long they would take to cook. The spinach cooks very quickly and will be done even in 2 minutes, so go with the time it takes for soy curls to cook.